The Tucker Tigers middle school football team went undefeated (9-0) to help pave the way for the school to win the 2017-18 DCSD Middle School All-Sports Award. Tucker Middle School claimed the 2018 DCSD Middle School All-Sports Award for the first time in the history of the award (2008-2018) with an 87-84 win over 2017 winner Chapel Hill. The Tigers went undefeated in football at 9-0 to claim the Region 1 and county championships (22 points). The Tigers took that title and doubled up by winning the boys’ track championship (24 points) to account for over half of the 87 points. Tucker also won the Region 1 boys’ basketball title to aid the cause. Tucker collected just its third Top five finish and first overall title with its 2018 performance. The program had finished third in both 2014 and 2015 which was its previous high mark in the standings. Tucker became just the sixth different school to win the award in the 11 years. Chapel Hill (3) is followed by Cedar Grove, Miller Grove and Stephenson with two wins each with Champion and Tucker claiming one apiece. Chapel Hill which narrowly won its county leading third All-Sports Award 92-91 over Chamblee a year ago came up three points shy of a fourth title. 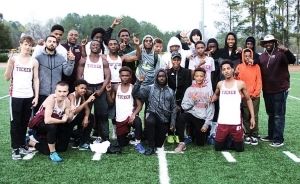 Tucker’s second county championship (boys’ track) clinched the 2017-18 DCSD Middle School All-Sports Award for Tucker Middle. The Lady Panthers finished the season undefeated (17-0) with the Region 4 and girls’ county basketball title (31 points) in hand to lead the way. Chapel Hill picked up county runners-up finishes in boys’ basketball (19 points) and boys’ track (19 points). Stephenson holds two All-Sports titles coming in the 2010 and 2012 seasons and came up just 10.5 points (76.5) behind Tucker and 7.5 behind second place Chapel Hill. Stephenson won Region 2 titles in football (11 points) and boys’ basketball (20 points) while coming in second in girls’ basketball (21 points). Stephenson leads the county in Top 5 finishes with 10 with only the 2011 season finish not in the Top 5. Lithonia picked up its second Top 5 finish since 2014 coming in fourth with 70 points. Lithonia won the Region 3 titles in football (11 points) and boys’ basketball (16 points) and took second in the county in the girls’ track championship (19 points). Cedar Grove finished fifth for the seventh time with 65.5 points to tie Miller Grove for third in Top 5 finishes. The Saints won the Region 4 title in girls’ and boys’ basketball. Renfroe of Decatur put together its highest finish since joining the DeKalb Middle School Championships totaling 61 points to come in sixth overall. The Bulldogs captured the boys’ basketball county championship (26 points) while also winning the Region 2 girls’ basketball title (20 points).